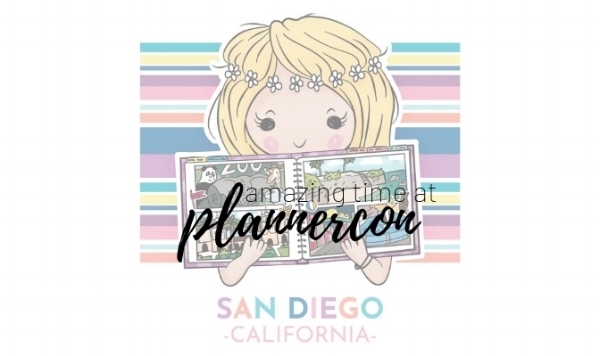 What a fantastic time I had at Plannercon parties in San Diego. If you have never been to a PlannerCon, then you are missing out. I sum it up like this, you are with all your own people who love and share the planning passion as much as you do. You learn some new things and make a ton of new planner besties! I had the privilege to teach a crafty make and take in San Diego. Earlier this year I taught Planner 101 at the full conference PLANNERCON in San Francisco. PlannerCon parties is a smaller scale than the full conference but SO much fun and the shopping was amazing. Along with making new friends and shopping there was also education. Amy Tangerine taught a fun travelers notebook workshop and Nicole Rixon from Sweet Stamp Shop taught us that we are all artists with watercolors. Plus games, food and overall happiness. I also had my whole planner tribe there aka my besties! I love PlannerCon so much that I will be back in 2019 to not only teach but I have been asked to speak on the panel, ummmmm YES!!! I love our crafty planner community so much, if you are new to crafting or planning be sure to join a group and go to a meet up. You will meet so many awesome friends and probably learn a thing or two. Let me know in the comments if you have ever been to a meet up on planner conference. Here are few of my favorite photos from the event.